Let me start this off so you can get my correct frame of mind. I AM EXHAUSTED...and it's only Wednesday. My body is pitiful! My legs are sore, my shoulders are weak (my arms shake when I pick up my cell phone) and my eyelids weigh 7 lbs each! I have had amazing workouts this week. I told you all about Monday but yesterday was something special and since I choose sleep instead of a post I'll tell you about it now. I was bike heavy yesterday. I started off with an early morning spin class and row/run session. I got an awesome burn before 8 am. I've really been trying to speed up my run so I did run on ye treadmill so I could set the speed and go without worrying about slowing down. It was only about 15 minutes but it was 15 minutes on pace. After work it was off to ride a bike on the road. Riding a stationary and riding on the road are so different and I would have never believed that! When Im in spin class and we go to a climb I get out of the saddle and run standing up. When Im on a road bike I sit and down shift so I dont have to stand up. We went for a long ride on some kinda back roads but with some traffic. (Apparently I have to learn to ride in traffic!) 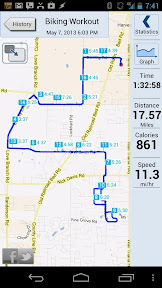 I have been told for a week about a massive hill that I would have to climb at the end of the 17 mile ride. It was a doozie! Im sure people climb bigger ones every day but for me this i new and Im still thinking a small hill is Everest! As I started up the hill I was actually saying out loud "I can do this" and when I tried to down shift my gears didn't shift right. I didn't know to move to my smaller ring before I got all the tension on my chain. It got stuck. I was still determined to make it up this hill so I hopped off and fixed the shift and got back on right in the middle of the hill! Once I was in the right gear all was good and I was able to get to the top of the hill. I wish I hadn't gotten off but I was still happy to make it to the top! Just for you Sister 2! I think post ride is where the tiredness really set in. I was all set to get home early and get in bed, but then I don't know what happened. I got home and the next time I looked up it was 10:30pm and I was still cooking my eggs for the next day. I hurried the process and got in bed but the damage was done! I got up this morning, amazingly enough, and I was early to the gym. Thats right, EARLY! I think 1 minute after class starts is on time but today I was like 3 minutes early. This is when I realized that my legs were still pretty fatigued from the rides the night before. 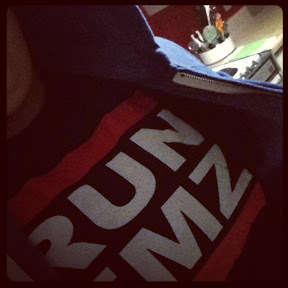 I managed to show some support for my girl @RunEmz in my shirt. I made it through the first class with lots of groaning and whining and then went out to the aerobics room for some time on the elliptical machine. I made it about 30 minutes before I was done! I had 30 minutes left and I just couldn't do it....I got off, went to the car and got my bathing suit. I had to do something that didn't require me to run/use my quads for one more second. I swam a few laps, I had to swim with my eyes open cause if I closed them they got heavier and heavier and I figure the worst place to fall asleep is in the middle of a swimming pool while you are swimming laps. I was tired most of the day but able to make it through. I went and got a pedicure at lunch and enjoyed getting my legs rubbed, I couldn't talk the guy into rubbing my quads but I tried. This was when I realized the true extent of my exhaustion. The soft touch of the massage almost made me cry. Thats real! After work it was off to BootCamp (you can imagine my excitement for that) but luckily she had a hard one planned tonight. We ran .5 (seemed like 10) miles through the park to the steps. Did several rounds of burpees, jacks, dips, pushups, and mountain climbers and then ran over to a huge hill (Everest) to do a few hill sprints before doing some ab/leg work and then running back the gym. Again, several times through this workout I wanted to cry, not cause it hurt but because I was DONE! I AM FINALLY HOME! Those are the happiest words I have tonight. I have managed to get packed up for tomorrow and post (complain) from bed tonight and hopefully get rested up before I go again tomorrow. I only have one workout tomorrow so Im gonna try to make it a good one and get in bed early. I say that every night but it never happens.